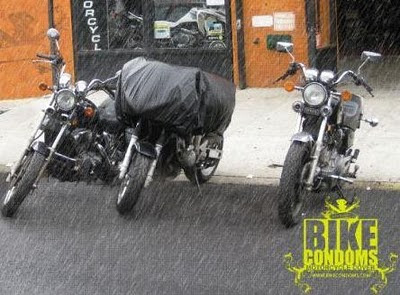 Bike Condom is a motorcycle cover that will fit inside your pocket. It's biodegradable so that you can use it once and throw away. And priced at $5.99 each, with free shipping, you can afford to do so. Just today, it was announced that Bike Condom won the grand prize Dealer's Choice Award in the Third Annual Dealernews International Powersports Dealer Expo Kickstart New Product Contest, held in conjunction with the 2010 Dealer Expo in Indianapolis, Indiana. The competition recognizes the hottest new products in the powersports industry based on innovation, design and manufacturing quality, marketability, and distinction in the marketplace. No word yet if they're planning a "ribbed for her pleasure" version. $5.99 plus tax and shipping---I got mine for 42 cents and found them in my garage. We call them yard trash bags. Just to be honest they are not "biodegradable", whatever that may mean.